MARCH 31, 2016, ARLINGTON, Va. (NNS) – As the Navy’s Ice Exercise 2016 winds to a close, officials at the Office of Naval Research reported new scientific research, March 30, that will enhance our understanding of, and ability to safely operate in Arctic maritime environments. 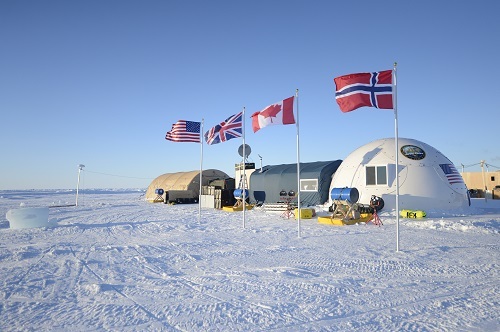 ICEX, a biennial, multiweek exercise sponsored by the Navy’s Arctic Submarine Laboratory, is designed to test submarine capabilities in the Arctic and provide a base camp for cooperative scientific research. 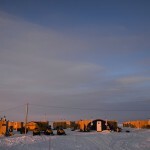 The temporary camp sits on a thick piece of floating sea ice approximately 200 miles north of Barrow, Alaska. 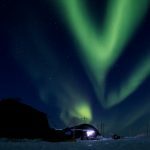 This year, for the second time in a row, the ICEX base camp had to be evacuated when cracks in the ice were discovered, underlining the importance of better understanding the changing region. One of the significant ONR-sponsored projects involved the launch of an unmanned underwater vehicle to measure temperature, salinity and ambient noise conditions beneath the surface — factors that can dramatically impact the effectiveness of sonar operations. 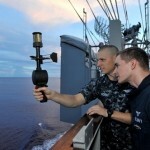 Sonar is a naval technology that uses sound in the water to detect and track submarines, popularly known by the famed “ping” signals shown in movie and television depictions. 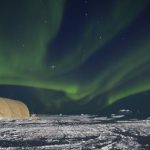 The ONR UUV collected data within a submerged layer of warm water, known as the Beaufort Lens, which is flowing into the Arctic from the Pacific Ocean. This knowledge could prove essential for improved detection, classification and tracking of vessels. In related efforts, ONR-sponsored students from the Naval Postgraduate School measured and analyzed the loss of transmission signals over different frequencies as sound penetrated the warm layer of the Beaufort Lens. Other students studied characteristics under the ice at the sea-ice interface. ONR’s Arctic and Global Prediction program also supported Naval Research Laboratory work during the exercise that used airborne and space-based synthetic aperture radar to develop methods to remotely determine the thickness and age of Arctic sea ice floes. 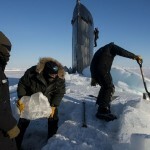 “The Arctic Ocean is a dynamic and particularly challenging maritime environment,” said Capt. Robin Tyner, military deputy to ONR’s Ocean Battlespace Sensing department. The U.S. Navy Arctic Roadmap 2014-2030 assigns ONR lead responsibility for improving Arctic assessment and prediction, and developing comprehensive computer models to support ocean, ice and atmospheric forecasts.